Article Description: Keeping your chain clean is a small but important detail in keeping yourself moving down the road. This article will demonstrate the importance of cleaning the motorcycle chain, and teach you how to clean motorcycle chain quickly. With little more than a toothbrush and a cleaning solution, you can make sure your chain is grime-free and long-living. Everything you need can be found in your home right now, but a few speciality products are included in this article for the more dedicated. After a couple of hundred miles on the road, your motorcycle chain is going to get grimy. 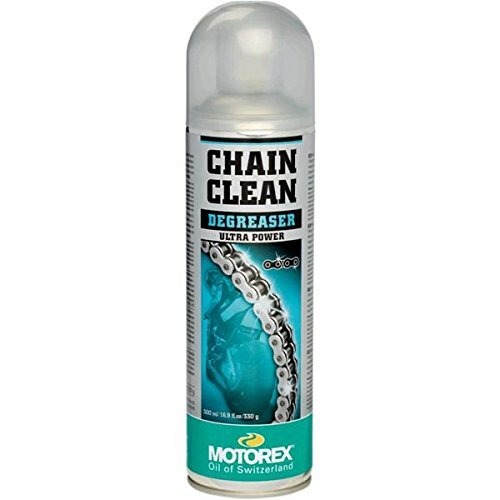 A good understanding of how to clean your motorcycle chain will help you get the most out of your ride. The motorcycle chain is the most popular of three options for a motorcycle’s drive system (the other two being belt and shaft). The chain is responsible for transferring the power generated by your engine to the back wheel, moving your bike forward. The chain wraps around the gearset in the engine and the sprocket on the back wheel, which is lined with teeth that interlock with the chain. Due to the high amount of force placed on the chain as the gears spin, it can deteriorate quickly if not properly cared for. Dirt can work its way into the rollers of the chain as you ride, and this will speed up the deterioration process. Proper care for your chain manifests itself in the form of cleaning, lubricating, and sometimes tightening your chain. In my 7+ years on the road, I’ve replaced chain after chain, and if I had only learned to keep it clean I might’ve saved a few bucks along the way. In this article, I’ll give you a break-down of the steps necessary to keep your chain clean as a whistle. Make sure to use a chain lubricant that’s specifically for chain drives. I like to use Maxima Chain Wax, because in my experience it’s the easiest lubricant to find. Newspaper, cardboard, or plastic bags will do the trick. You have several choices here. My personal favorite is to mix a mild soap with water, because it does the job and you won’t have to make another trip to the store. If you want a deeper clean, some people enjoy using kerosene. This chemical is a bit unhealthy to work with, so if you choose to work with kerosene, do so with rubber gloves in a well-ventilated area. If you’d like to go down the more professional path, there are industry-specific chemicals designed for your motorcycle chain. 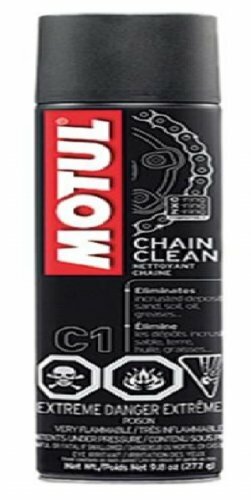 The two most popular are Motul Chain Cleaner and Motorex Cha﻿﻿in Cleaner. Maxima makes a reliable chain cleaner as well. A toothbrush works perfectly, but various companies make a chain-specific brush that works on all sides of your chain simultaneously so you aren’t going over your chain three times. A wire brush can be used for non-sealed chains, but go with something softer for sealed chains. The wire brushes can damage the O- or X-rings found in a sealed chain, which are in place to lower the amount of required maintenance and retain lubricant. The first step is the most fun. Take the bike for a small spin around the block to warm the chain up. This will help to loosen all the dirt and buildup on your chain, and make it easier to clean. Ten minutes should do just fine. The second step is to park on a level surface and prop the back wheel up to inspect the chain. Propping the bike up so the rear wheel spins freely isn’t entirely necessary, but cleaning your chain on the ground and having to roll the motorcycle forward until every inch of the chain can be inspected will be a tremendous hassle. This can be a twenty-minute job or an hour long job, your choice. Place the old newspaper or cardboard underneath the chain of your motorcycle. Find the master link (you’ll know it when you see it; it is the only different chain link). Use the master link as a gauge so that you know that you’ve inspected the whole chain without repeating. If there are major chips, cracks, rust spots, or the chain is stretched as far as possible, the chain might need to be replaced altogether. If all is well and fine and the chain only seems to have more dirt on it than what makes you happy, move on to step number three. Take the cleaning solution described above to your chain. Use a brush to thoroughly scrub the chain with the solution, making sure to hit every chain (using the same master link described above). Spin the wheel to move the chain, and brush as it moves. When the brushing is all done, rinse with clean water and wipe the chain down with an old (but clean!) rag. WD-40 is good for helping to push the rest of the water out of your chain, but don’t use it on a sealed chain as it can displace the O-rings, and don’t use it as a lubricant. Wait until the WD-40 is completely dry, then move on to step five. Keeping the back wheel propped up, crouch directly behind your motorcycle and aim the lubricant aerosol straight at the back of the wheel sprocket where the chain is meshed with the sprocket teeth. As you turn the wheel, spray the chain until the whole thing is lubricated. Use the same chain link as you did in the 2nd step to make sure you’ve coated every link! And that’s all there is to it. Soap, brush, water, and wipe. Once everything is bone dry, hit your chain with the lubricant and enjoy your longer lasting motorcycle chain. Put those wheels to pavement, you earned a ride. If you liked our article on how to clean your motorcycle chain, feel free to share it! If you have secret tips that get your chain cleaned up faster than the ones we have here, we’d love to hear them in the comments. Thanks for reading, and keep it vertical.